NEW ORLEANS— All four National Athletes of the Week made the all-time top ten divisional lists for their events, and one broke a collegiate record. The U.S. Track & Field and Cross Country Coaches Association (USTFCCCA) announced the winners on Tuesday morning. Sandi Morris of Arkansas broke the collegiate record in the pole vault for the third time this year, and because of the schedule, she knows that this one will last longer than the other two did. This is Morris’s third NAOW award of 2015. The other three winners are first-timers. They are: Maicel Uibo of Georgia, Charlie Marquardt of Haverford, and Heather Ingraham of Vassar. Again, those three are among the top ten ever in their division and event. Those divisions and events would be the DI men’s decathlon for Uibo, the DIII men’s 1500 or Marquardt, and the DIII women’s 400 for Ingraham. There are no NJCAA or Division II awards this week. The junior college season is over, and Division II had last weekend off before their national championships this weekend. These are the last National Athlete of the Week awards for the 2014-15 academic year. Click each of the student-athletes’ names above or keep scrolling below to read about the exploits that made all ten worthy. 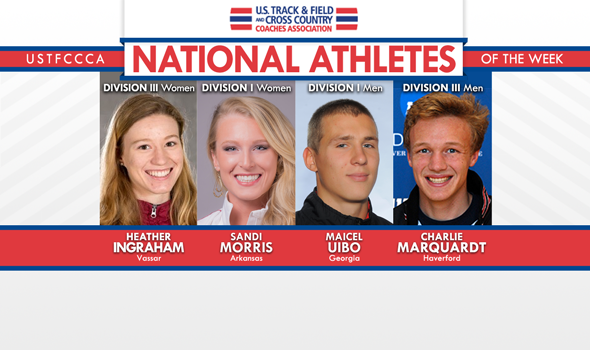 National Athlete of the Week is an award selected and presented by the USTFCCCA Communications Staff at the beginning of each week to ten (male and female for each of the three NCAA divisions and the two NJCAA divisions) collegiate track & field athletes. Nominations are open to the public. Coaches and sports information directors are encouraged to nominate their student-athletes; as are student-athletes, their families and friends, and fans of their programs. Uibo won his third straight SEC decathlon with a career high 8,326 points–higher than the score that won him an NCAA championship last June. That’s the highest score since Ashton Eaton’s 8,457 at 2010 NCAAs and makes Uibo the No. 4 performer in collegiate history. It’s also the best score in the world this year. The Estonian junior won all six field events and cleared 2.18m for a career best in the high jump. Morris and Demi Payne now have the five best outdoor vaults in collegiate history–Morris has three of them–and seven of the best nine ever. That matches their indoor excellence, where the two of them have the eight best vaults in collegiate history. Marquardt took third in his section of the 1500 at the Swarthmore Final Qualifier in 3:43.84, making him the No. 8 performer in DIII history and the No. 5 regular season performer. With Marquardt joining the top ten, Haverford now has five of the ten fastest 1500 performers in Division III all-time; Marquardt is the third fastest Haverford man ever and the fifth fastest DIII in-season runner ever. You can watch video of the race here. Heading into this weekend’s NCAA championships, he has the fastest 1500 time by almost two seconds. Ingraham won the 400 meters at the ECAC meet, running 54.15 seconds and winning by more than two full seconds. That makes her the fastest 400 runner in DIII this year and the seventh fastest DIII performer ever. Ingraham also has national-qualifying times in the 200 and 800, but is only contesting the 400 at this weekend’s NCAA meet. Though she has the fastest DIII 400 time this year, she’s only the third returner from last year’s nationals and will face off against the top two at St. Lawrence.